RAMONES REISSUE 1, 2, 3, 4 DISC DELUXE DEBUT! THE RAMONES’ iconic debut album gets the deluxe reissue treatment this summer in honour of its 40th birthday. The album, which made punk standards of tracks like ‘Blitzkrieg Bop’, ‘Beat On The Brat’, ‘Judy Is A Punk’ and ‘Now I Wanna Sniff Some Glue’, is being made available in a three-CD / single vinyl album set, comprising stereo and mono mixes of the album, a disc of outtakes, single mixes and demos – many previously unreleased – plus two live sets recorded at the Roxy in West Hollywood on 12 August 1976, one of which is being made available for the first time. 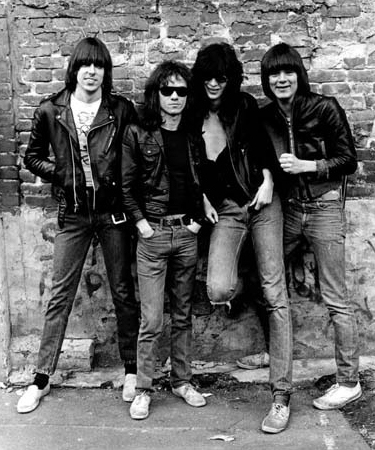 Packaged in a 12″ x 12″ hardback book, the release also features extensive production notes about the recording of the original album by producer Craig Leon and an essay looking back on the Ramones’ early days by rock journalist Mitchell Cohen, along with additional pictures taken by Roberta Bayley, whose iconic photo of the band graces the album’s cover. Released on 29 July through Rhino Records, the package is a limited edition of 19,760. Check out this ace ’76 clip from Max’s Kansas City! ‹ GANG SINGLE IS SEW UNREASONABLE!